Burr mills do not heat the ground product by friction as much as do blade grinders ("choppers"), and produce particles of a uniform size determined by the separation between the grinding surfaces. Food burr mills are usually manufactured for a single purpose: coffee beans, dried peppercorns, coarse salt, spices, or poppy seeds, for example. Coffee mills are usually powered by electric motors; domestic pepper, salt, and spice mills, used to sprinkle a little seasoning on food, are usually operated manually, sometimes by a battery-powered motor. The uniform particle size achieved using a burr grinder is desirable for coffee preparation. However, some methods of brewing may be more tolerant of the range of particle sizes produced by a blade grinder; this may be the case for percolated coffee. Regardless, burr coffee grinders are more suited for keeping the flavor and aroma of the coffee beans intact. This is because burr mills produce less heat from friction compared to blade grinders; this is especially important for coffee aficionados looking to get the most flavor from the freshly ground beans, as heat from friction lessens or taints the natural flavor. Burr grinders create less friction and require lower motor speeds, which reduces potential flavor loss due to heat. Burr grinders obtain these lower speeds through two mechanisms. The lower cost models generally use a small electric motor to drive a series of reduction gears, while better constructed and more costly examples use a larger commercial motor and a belt, with no gear reduction to spin the burrs. The latter example is termed "direct drive". The reduction gear versions are noisier and usually do not have the lifespan of the direct drive units. Electrical powered burr grinders are available in many variations. Some grinders are "stepped" meaning that they are fixed by the factory into a set series of adjustments while "stepless" varieties use a worm drive or other mechanisms to offer an infinite number of adjustments within their grind range. Other variations include grinders that are equipped with dosers and others that are "doserless". Dosers function as a catch bin to collect the ground coffee and by using a lever, users are able to dose a set amount of coffee. Doserless versions remove the bin and dosing function, and the grinder outputs the ground coffee directly into an espresso machine portafilter or into another container. The doserless examples normally feature additional functions such as weight based or advance time based grinding in order for a barista to grind for an exact amount of grounds required for a specific espresso shot. Manual coffee grinders have been largely supplanted by electrically powered ones where the object is simply to get the job done; manual grinders are used more for their appearance, and are often more costly than electric models. An exception is the manual Turkish coffee grinder; these are inexpensive, and can grind coffee to fine powder for Turkish coffee, unlike electric models. Many grinders are free-standing; some larger coffee grinders are fixed to a wall. The first coffee grinder was made by Richard Dearmann, an English blacksmith from Birmingham, in 1799. This grinder was widely distributed in the US, where Increase Wilson patented the first wall coffee grinder in 1818. There are several types of materials used in pepper mills, each with its own particular advantages. 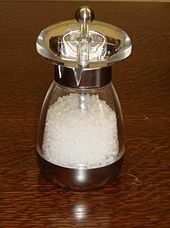 Corrosion-resistant materials are used to grind salt. Stainless steel: One of the most suitable and durable materials for grinding peppercorns and coffee beans. The male and female sections of the grinding mechanism are usually made from sintered metal. This material is preferred by professional chefs. The teeth of the grinder are machined to cut spice or beans. Stainless steel is not suggested for grinding salt. Zinc alloy: Perhaps the most common mechanism found in pepper grinders, zinc alloy is composed of a mixture of metals, primarily zinc, often with chrome plating to resist corrosion. It is a good choice for grinding pepper but is not suitable for grinding salt. Carbon steel: An extremely hard metal, carbon steel provides the sharpest edges and most efficient grinding capability, and is preferred by professional chefs. Carbon steel is not suitable for grinding salt. Ceramic: Ceramic is extremely hard and provides the best performance for multi-use grinding. It does not corrode and is suitable for grinding coffee beans, pepper, salt, and spices. Acrylic: Durable and low cost, acrylic is a non-corrosive material suitable for grinding salt and spices. Electric burr grinders are powered by electricity from a battery or mains supply. An electric motor drives the grinding elements against each other. Electric grinders grind faster than manual grinders with no effort, but friction and waste heat from the motor may heat the ground product slightly. ^ a b Steiman, S. (2015). The Little Coffee Know-It-All: A Miscellany for growing, roasting, and brewing, uncompromising and unapologetic. Quarry Books. p. 89. ISBN 978-1-62788-322-1. Retrieved October 14, 2017. ^ a b c Stephenson, T. (2015). The Curious Barista's Guide to Coffee. Ryland Peters & Small. p. pt180. ISBN 978-1-84975-908-3. Retrieved October 14, 2017. ^ Easto, J.; Willhoff, A. (2017). Craft Coffee: A Manual: Brewing a Better Cup at Home. Agate Publishing. p. pt69. ISBN 978-1-57284-804-7. Retrieved October 14, 2017. ^ a b Kingston, L. (2015). How to Make Coffee: The Science Behind the Bean. Abrams Image. p. 84. ISBN 978-1-61312-790-2. Retrieved October 14, 2017. ^ Davids, K. (2013). Coffee: A Guide to Buying, Brewing, and Enjoying, Fifth Edition. St. Martin's Press. pp. 118–119. ISBN 978-1-4668-5442-0. Retrieved October 14, 2017. Rahman, S.; Ahmed, J. (2012). Handbook of Food Process Design. Wiley-Blackwell. pp. 944–945. ISBN 978-1-4443-3011-3. Retrieved October 14, 2017.